Wimereux is the oldest resort on the Opal Coast, in the south of the Grand Site of Two Caps. 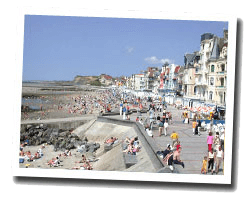 The seafront promenade is lined by seaside villas in Anglo-Norman style and offers beautiful views of the Pas-de-Calais and Boulogne-sur-Mer. At the seaside, you will find a sandy beach perfect for children, sand yachting and kitesurfing. In Wimereux, enjoy a seaview holiday rental. 3 rooms apartment 34 m2 on the 2nd floor (with lift) in a residence. Balcony with outdoor furniture and deck chairs. Nice view of the sea and the beach. 3 rooms apartment 60 m2 (with lift) in the "le grand bleu residence". Balcony with outdoor furniture. Nice view of the sea and the beach. Direct access to the sandy beach. studio apartment 26 m2 (with lift) in the "de la Côte d'Opale residence". Nice view of the sea and the beach. Direct access to the beach. 2 rooms Apartment 37 m2. Terrace with outdoor furniture. Nice view of the sea and the beach. Direct access to the sandy beach. 1 Bedroom(s), 1 double bed(s). short stays possibility. Final cleaning : 30 €. Studio Apartment 25 m2 in a residence. Nice view of the sea and the beach. Direct access to the sandy beach. 0 Bedroom(s), 1 double bed(s). short stays possibility. Final cleaning : 20 €. 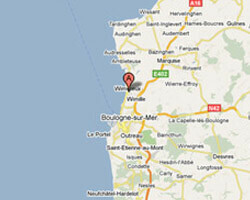 3 rooms Apartment 60 m2 in the secure residence "les Dunes du Golf residence". Balcony. Distance to the sea: 200 m. View of the sea. House 85sq. m with magnificent sea views. Terrace of sight. 2 Bedroom(s), 3 double bed(s). short stays possibility. Final cleaning : 30 €. 2 rooms apartment 30m2. Close to town centre. terrace. Pets allowed.